La Gourmandine Hazelwood. All photos by Tom O'Connor. 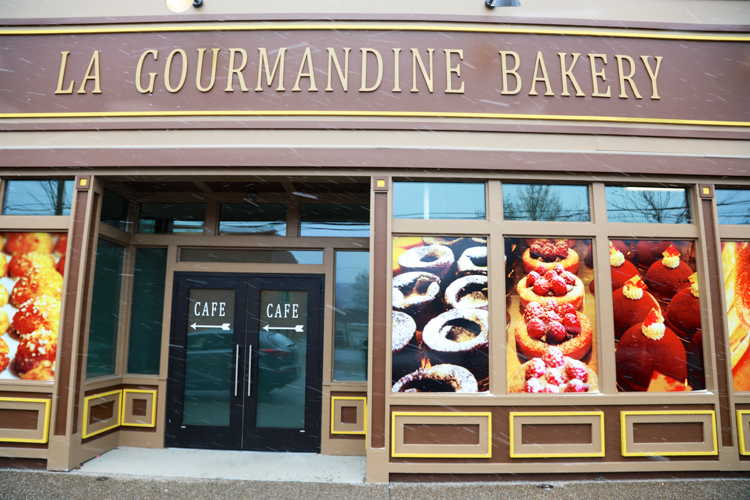 Second Avenue in Hazelwood is smelling much sweeter these days as French bakery La Gourmandine prepares to open its third Pittsburgh location on Monday. 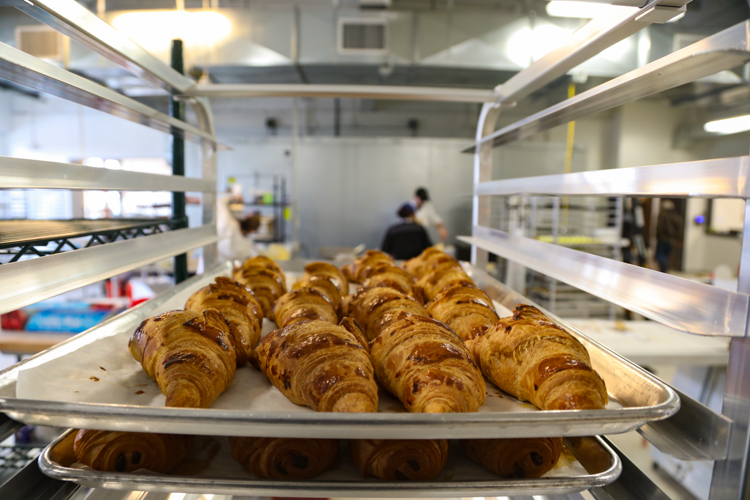 The artisan bakery is a key part of the area’s revitalization effort. 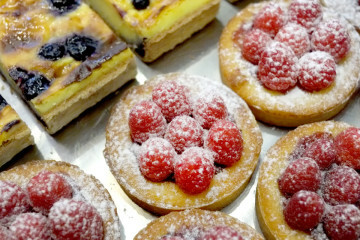 A popular destination for baguettes, croissants and exquisite pastries, La Gourmandine often has customers lining up outside both its Lawrenceville and Mt. Lebanon locations. The new bakery space and retail shop is taking over the former site of Dimperio’s Market, a longtime grocery fixture in the area that closed in 2009. A new fresh food option in the Hazelwood commercial district is seen by many an important step in energizing the area. 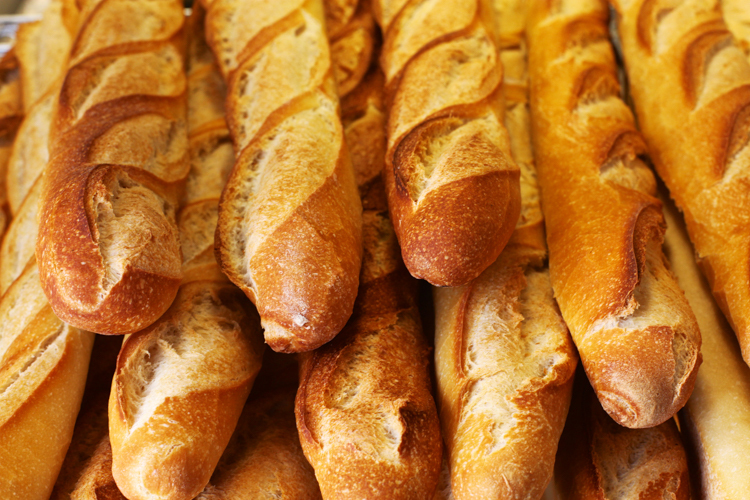 “It’s heartening to have a private business investing at this scale in Hazelwood, bringing fresh baked goods and good jobs to the neighborhood,” says Linda Metropulos, Director of Housing and Neighborhood Development at Action Housing, Inc.
Freshly baked baguettes at La Gourmandine bakery. As NEXTPittsburgh reported last year, the idea of La Gourmandine taking over the long vacant Dimperio’s Market space was the result of a years-long search by downtown residential nonprofit agency Action Housing to revitalize the Second Avenue business center. Both La Gourmandine and Action Housing invested in the buildout phase of the location with funding from multiple sources including the Heinz Endowments, Pennsylvania Housing Finance Agency and Dollar Bank. La Gourmandine’s owner, Fabien Moreau, is welcoming the opportunity to bring a new retail option, and hopefully a positive impact, to the commercial district. He has been down this road before. When he picked Lawrenceville to set up his first shop seven years ago, he initially encountered some skepticism, but is now credited for being part of the wave of revitalization that has transformed that neighborhood. 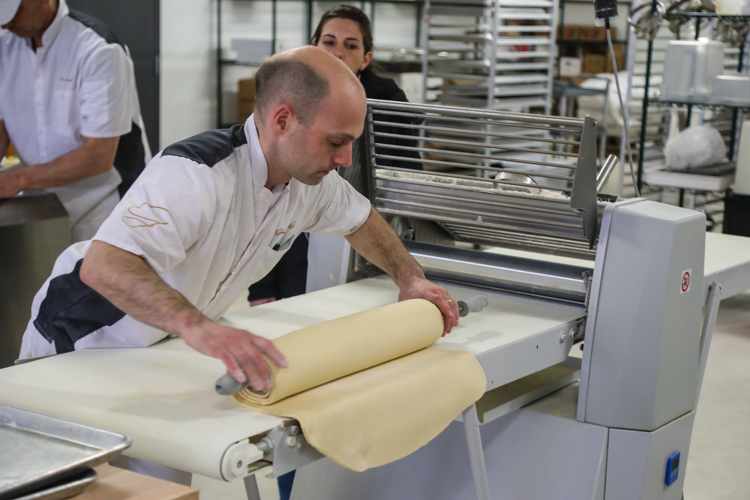 Owner Fabien Moreau prepares pastry dough in the new Hazelwood facility. Freshly baked croissants at La Gourmandine. The nearly 5,000-square-foot production facility behind the shop provides a much greater workspace than at either of the bakery’s other locations. In fact, the Hazelwood operation will now be able to carry a much heavier load of the bread making production. Newly installed bread ovens are already busy at work. 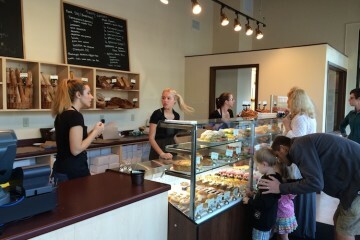 “Customers at the new shop will be able to see the baking team at work in the kitchen and bread being loaded into the oven,” says Moreau, adding: “The front of the shop will be the same, with the same menu as the other locations.” This includes a full assortment of fresh baked artisan breads and croissants, all the delicious French things like viennoiserie (breakfast pastries), patisserie (cakes and pastries), as well as savory sandwiches and quiche. Moreau acknowledges that some items on the menu may be more expensive than in grocery stores, often because they are labor intensive and because of the specialty ingredients, but as always, an effort will be made to make many items affordable. La Gourmandine’s Hazelwood location is at 5011 Second Avenue. The Hazelwood shop opens to the public on Monday. For more store information and hours, check the website.